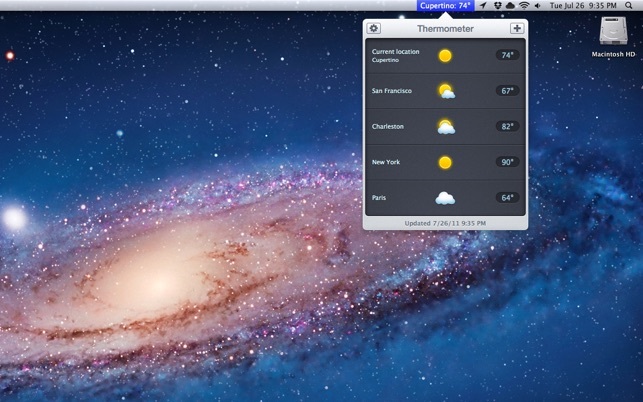 Check weather conditions at your current location and other locations worldwide. 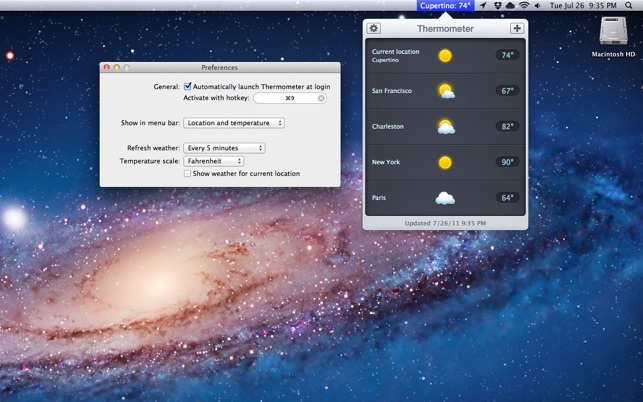 - Thermometer integrates seamlessly with the new dark mode. This is a nice and simple little app that does exactly what you buy it for - it puts the local tempurature on your Icon Bar with the option of just Temurature showing, Temperature and Location showing, nothing showing, or multimple locations cycling. It also allows you to pick the update information cycle from every minute to much longer. Very simple and no fuss, just what I wanted. Perfection ion a neat little box. I loved this for the longest time, then it stopped working properly (stuck on 32 degrees for every location), and now it works again. NO LONGER WORKS!!! NO LONGER SUPPORTED! DO NOT PURCHASE! Worked great for a while. Now it says 32 degrees for every location. Bummer, I loved it while it worked. Is anyone supporting this app? It needs to be fixed.